For the beginner level entrepreneurs, free HTML eCommerce templates are real gems to get started with power and comfort. Read the whole post to know more. Creating your own business is an interesting and inspiring idea and it results best when you do the works from your home. Before quitting your day job, make sure your idea is a sumptuous and a creative one. Rest assured we will help you out here to start with a prolific step. Choosing the right ecommerce website templates was never easier although it requires a serious attention. If you just wish to write your name in the line up of successful people, you need to make decisions at the right time with right choices. eCommerce is a modern day business and the field is expanding in a large aspect, so you’re in a very positive and a demanding track, I must say. How come you will follow the latest design trend with proper UI and UX thinking to nurture in mind? The standard is well set, you just need to be more accurate while you’re updating the site and setting up the shop. Let’s clear the fuzz, the list here is created solely so that you have to face no trouble at all. In the revolutionary time of the internet, your business needs to be globalized, as well. To make the web building process faster, choose an HTML5 template from the list below. Let’s start reading as we added only the top-grade bootstrap eCommerce templates for your success and prosperity. With the ecommerce website templates, one can easily create their online shop that will bring more traffic and more revenue. Get started. Grocery Store is an impeccable, magnificent, splendid and easy-to-use template. While you’re constantly looking for a well-designed and well-functional template, this theme here is a surprising one for your best purpose. Because of the modern, robust web technology like HTML5, CSS3, Bootstrap, and beautiful sliders – this template will help to reach far. To explore the business prospects, use Grocery Store and enjoy the functionality it provides for all, even if you’re not a coder. As the beautifully crafted design will make your visitor’s mind pleased, it will give you to be more powerful in the back, as well. Regardless of the browser types, it views nicely on every platform, and it appears with an uncluttered shape on mobile screens, not to mention that. 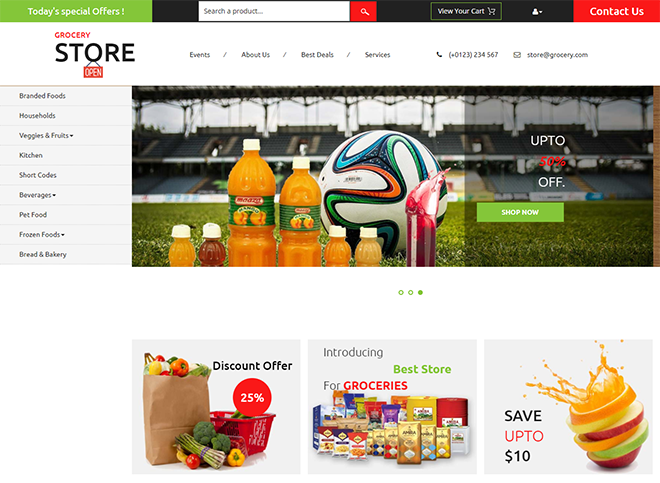 Grocery Store is one of the best free HTML eCommerce templates. Titan is a multipurpose template with several engaging demos inside. 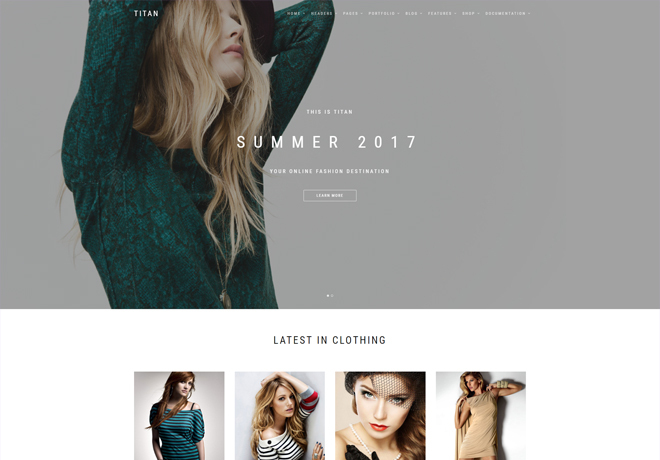 Amid free HTML eCommerce templates, Titan is a magnificent one because it incorporates an amazing shop demo. Besides that, it’s easy to use and the design is eye-catchy. If you go through the whole template several functionalities will amaze you. For instance, sticky navigation, on-hover animation, video background section, multi-level dropdown, and more. The design speaks itself while the features are outstandingly beneficial for all-level users. You’ll find multiple headers and pages inside the template which helps you big time to make a website easily and instantly. An eCommerce shopping web template is an integral part of this kind of business. Free HTML eCommerce templates are for making the webmasters powerful while they are constructing websites for online shops. 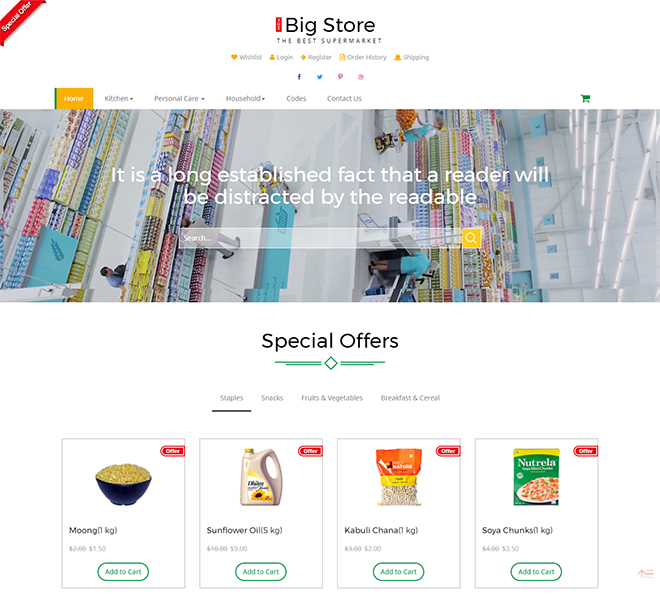 Big Store is an outstanding, splendid, exceptional, robust, and astonishing template for the professional users as well as for the novice people. The easy customization and easy-to-understand process will help you every user not to get panic. A complicated web structure is frustrating for beginner level webmasters. But you’re lucky enough that you’ve got Big Store for your smooth and painless journey. When you have more than 15 ready pages for an eCommerce website, you must feel the comfort while making the site joyously. Features like Font Awesome icons, video banner, subtle colors, shop cart, and fluid layout make the template a desirable one. 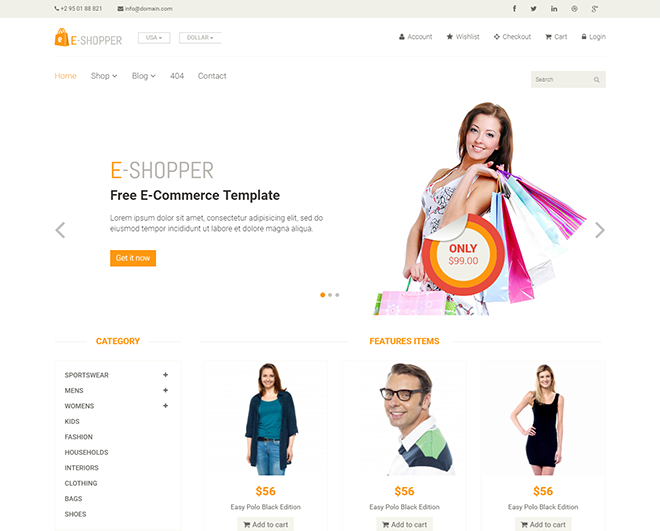 E-Shopper is a brilliantly designed, amazingly built, awesomely responsive, and wonderfully flexible high-quality template. Powered by the excellent Bootstrap 3 and sturdy HTML5, this theme marvelously aids towards your adventure of the constructing the site. Major browser compatibility makes the template to show smoothly on every platform no matter what your users are using. Also, the site works fantastic on multiple devices since it’s made on Bootstrap framework. Well-documented code is another easy and comfortable option for the users to get the maximum benefit of a well-organized web template. Moreover, the template is compatible with any website whether it is static or dynamic. For the above reasons, this bootstrap template is one of the best free HTML eCommerce templates. When you’re following the list of free HTML eCommerce templates, they all are great on the basis of different criteria. 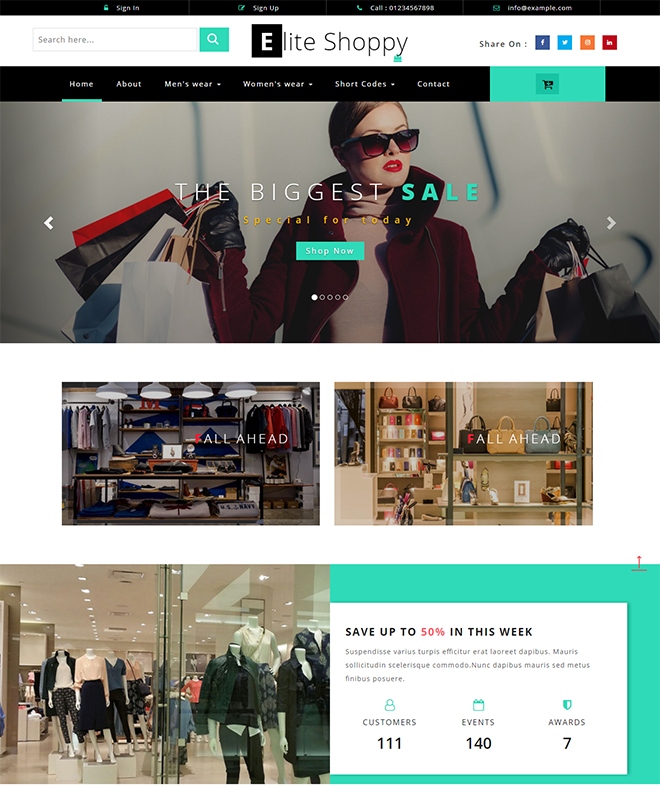 Shop is a freshly designed, carefully built, comparatively fast free HTML website template for online shopping store. With Shop, the entrepreneur of any business can start-off their site and create a great impression on the user’s mind. If you really need a powerful website then Shop will accompany you whenever you need a easily customizable template. Built with Bootstrap framework, it conveys modern features like parallax effect, counters, hover effect, Google maps, and so on. eElectronics is a ready-made shop for electronics shop yet it’s an ideal suit for any store. Amid many top quality bootstrap templates, this one is a specially chosen. The pages it includes have necessary elements and layout to create further options so that customers can find easily what they want. You can add all the links to other products and related categories for more user engagement. A complete web template that has decent typography, eye-pleasing design, and latest technology can boost your sell, of course. 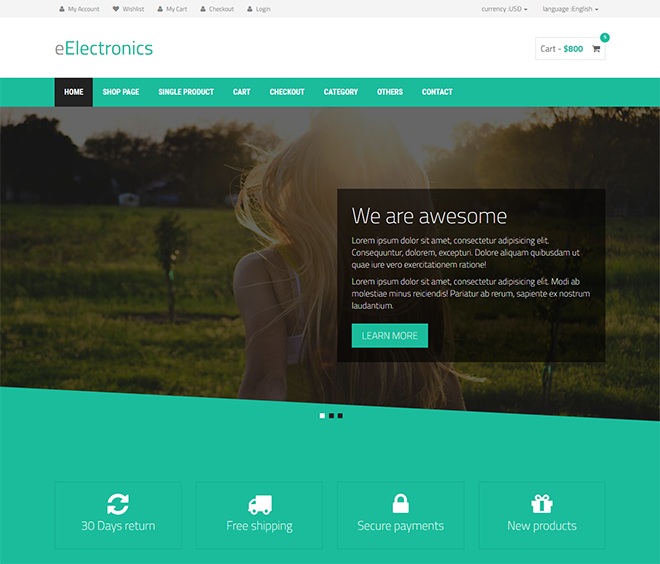 Among free HTML eCommerce templates, electronics made a really admirable existence. 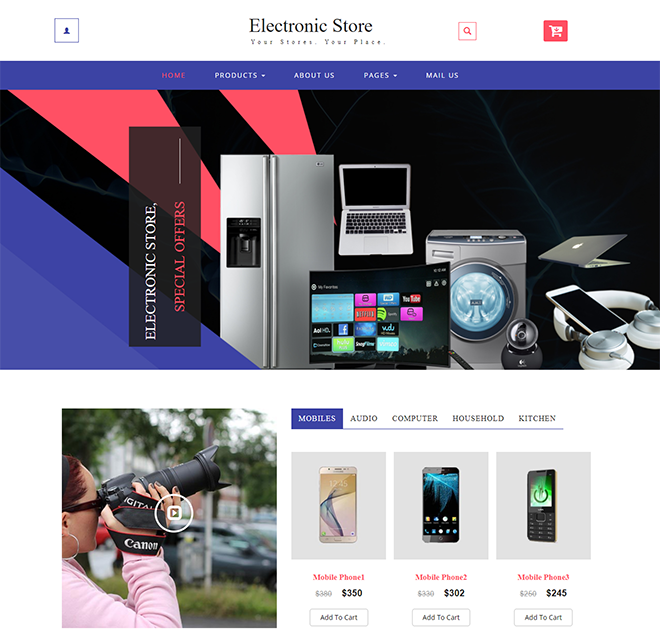 In the line up of free HTML eCommerce templates, Electronic Store is an ultimate, compelling, fabulous, well-oriented, and genuine template. With this high-calibre template, one can comfortably build a multiverse website for eCommerce and online shopping. No matter what is your business type or how expert you are because the Electronic Store is for everybody who wishes to form their desired business. For fashion and clothing, gadgets and electronics, grocery and food, firms and agencies – this awesome template is amazingly capable of doing all. Furthermore, it has many top-grade features like shopping cart, hover effects, stunning slider, responsiveness, and modern technology. 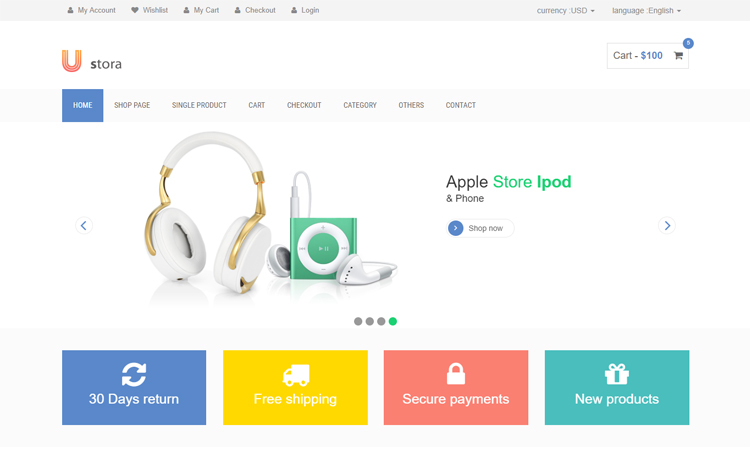 Elite Shoppy is another magnificent product amid free HTML eCommerce templates. It’s undoubtedly a great choice if you’re just looking for an eCommerce template that is compatible with modern browsers as well as smart devices. You can build sites for fashion, jewelry shop, furniture, digital goods, laptop and tablet, and anything you like. For your information, there’s no actual boundary for making websites in varieties domains. Elite Shoppy has a unique design and fresh elements that intuitively makes your site much beautiful and assist your endeavor to step forward from the competitors. The elegant and versatile design, Bootstrap based short codes, browser and device compatibility – everything’s there for better and amusing creation. If you find the right ecommerce website templates, your effort will just be easier. Before creating this post, we have studied a huge number free HTML eCommerce templates so that we can present you only the best in the market, which is free as well as highly functional. If you check the complete list, you can see yourself that how honest is our justification. 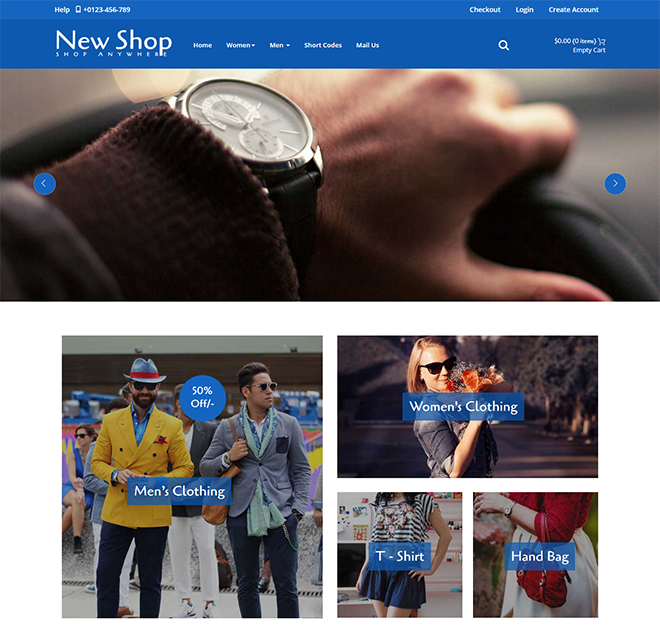 Shop is one of the top bootstrap eCommerce website templates for building online shopping sites. Such a clean, versatile, modern, powerful, and minimalist template will significantly provide you the most appropriate solution. Top features like animated scrolling, google map integration, up-to-date technology, drop-down menu and all others give you best experience while you start the business site. Fashion is obviously the hottest industry and one of the most profitable business categories among thousands of trading ideas. If you’re already in the clothing business or planning to start now, then we must congratulate you for that selective choice. But before you begin, you certainly need some powerful supportive tools and one of these is a high-quality eCommerce template. Its paramount features will let anybody to dominate with a stylish and functional website. Adaptive to any screen and compatible with all browsers, Fashion Club offers an extensive opportunity for making beautiful websites at ease and comfort. 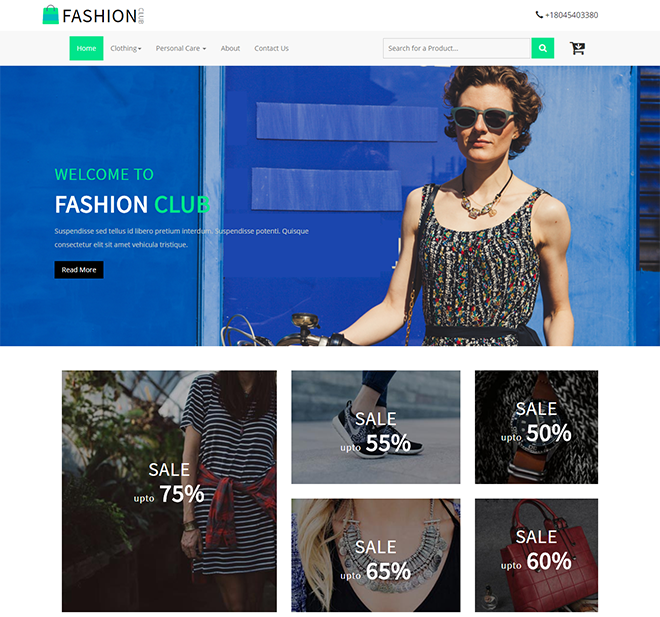 We wanted to give you some industry-leading ecommerce website templates and we brought a robust creation like Fashion Club. 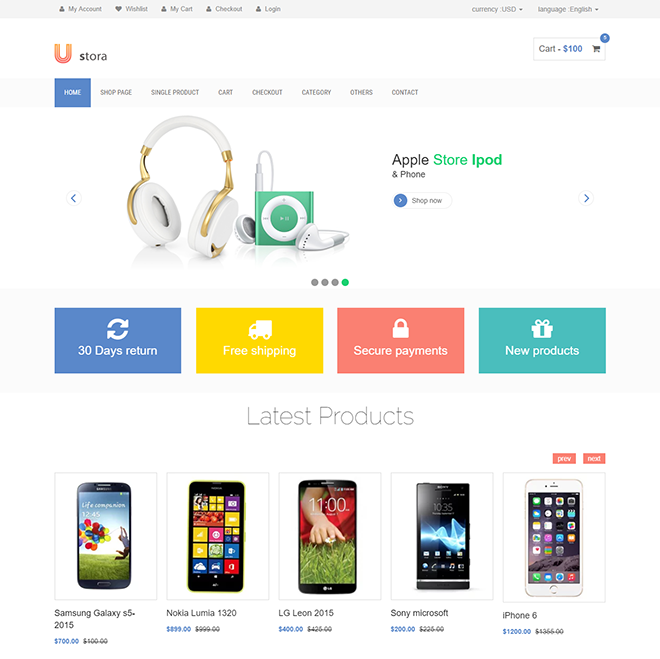 Ustora is a free, flat, clean, simple, beautiful, enchanting, tremendous, and incredible web template for making an eCommerce website. Any website for online stores is possible to build effortlessly with Ustora. It provides many features only high-grade template seekers will understand. One thing we believe that the better the functionality the comfortable your journey will be. You can easily organize your shop with all the products along with the necessary links for additional information. 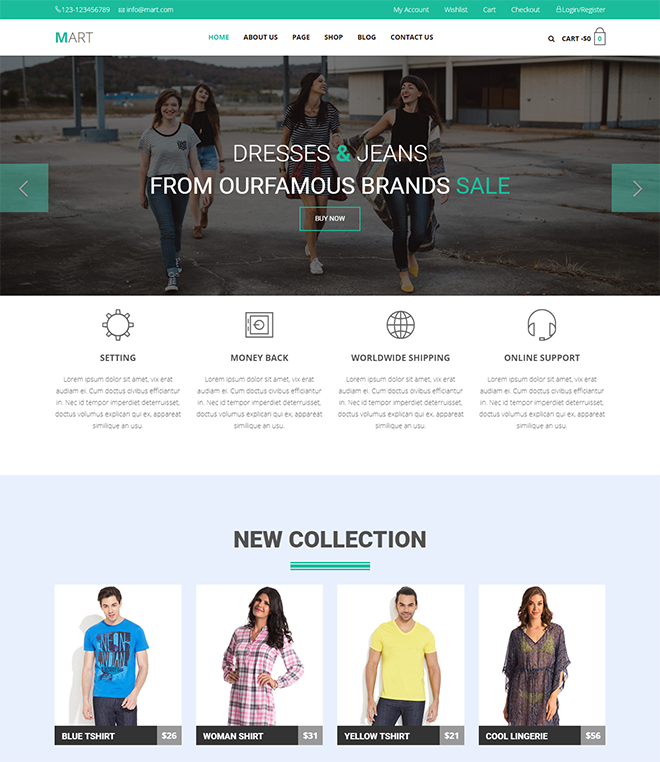 Undoubtedly this is an exemplary web template among free HTML eCommerce templates. Moreover, you can add some exclusive links like featured products and most selling products for better user attraction. New Shop is an elegant eCommerce website template to do more work with less effort. It will escalate the efficiency of your endeavor which eventually results in a prominent growth. This list of free HTML eCommerce templates is complete because of the New Shop. For many reasons, we recommend this terrific template for your future project. As this theme is flat and pretty simple, it will obviously ensure the peaceful visibility for the users. Although several necessary pages are given with the template you can add as many as you want. Also, you can customize the whole template implementing your idea and thought. 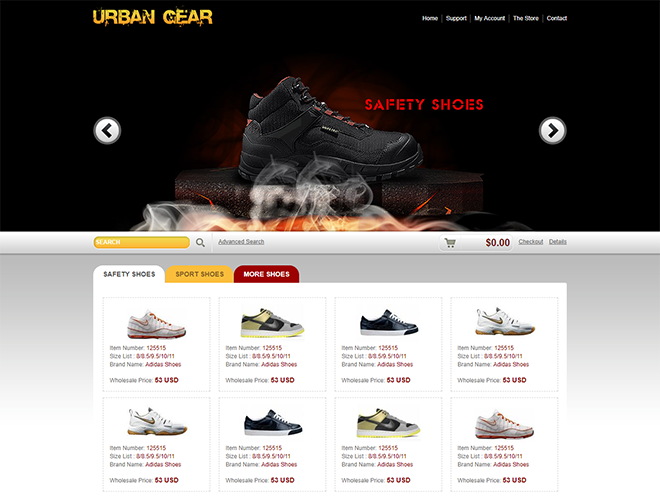 HTML5, CSS3, Bootstrap and modern technology have made New Shop a powerful tool for you. Mart is a breathtaking, implausible, dazzling, wonderful, multitudinous, and responsive HTML template. 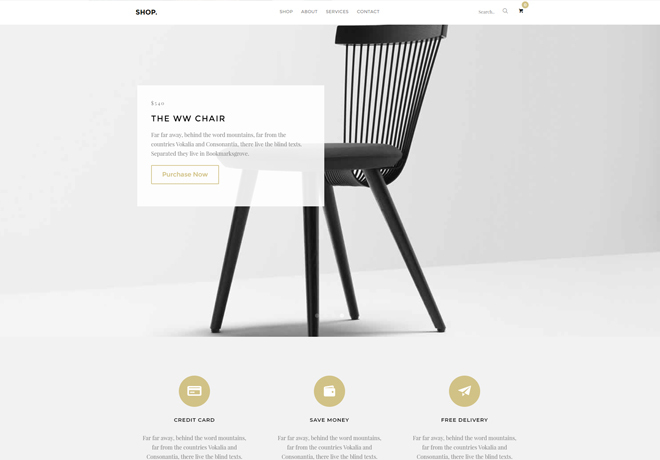 If you’re looking for high-quality, awe-inspiring free HTML eCommerce templates, Mart is one of them which is woth to try. Consequently, you’ll get the most flexible platform for editing, modifying, and creation. This theme is clean, entertaining, fanciful, and outstanding theme among bootstrap eCommerce website templates. Literally, there are hundreds of free html5 eCommerce templates available to download. But to search and find the right template with modern features and amazing design is a tedious work. That’s where this post of free HTML eCommerce templates comes into play so that you feel confident while making websites for eCommerce. Otherwise, you’ll fall into a confusing situation where no one is helping you out. People who want to run some extra mile should use this template. Undoubtedly Shopper is your best companion if you’re in quest of high-scale free HTML eCommerce templates. It’s no more dreaming of tuning up your site as you just want it. Among many popular and highly admirable free html5 eCommerce templates, Shopper is a champion-like tool, no doubt about that. For more to see, view the demo and then get it right away. The structure of this super-cool template is so easy that anybody with basic markup skill can make a website accordingly. As you see it looks pretty compelling similarly it works tremendously. For free HTML eCommerce templates, people go different places but you can’t find what you need. That’s why we created this wonderful list bootstrap eCommerce templates where every template is free, responsive, as well as high-quality. In fact, these themes are worth to spend for them. Since they don’t charge a single penny, you can use them as long as you need them and you want to create sites for online stores of any product industry. Free ecommerce website templates help the webmasters to build great online stores without any trouble. 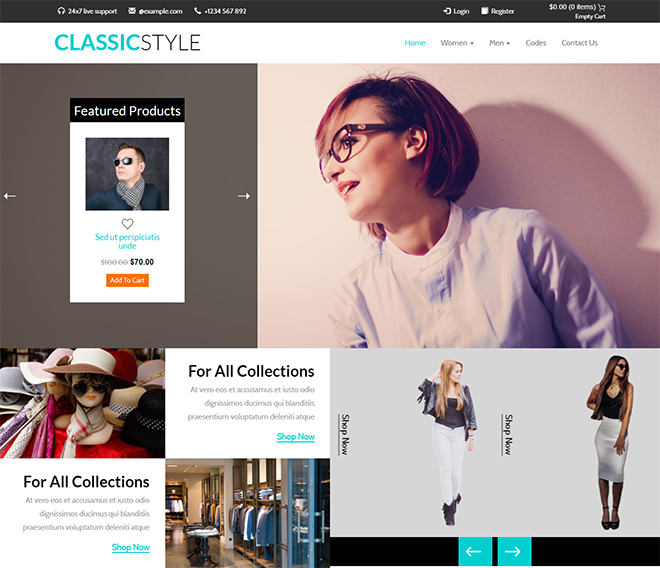 Classic Style is another sophisticated, stunning, powerful, and charming web template for making eCommerce websites. It’s the ultimate, robust, and exquisite addition to the compilation of free HTML eCommerce templates. This ultra-responsive template works fast and fantastic on every device available in the market. Besides that, for the creation of online shopping websites for any category, you don’t need different template rather than Classic Style. However, get this template and customize with your content. When you get free ecommerce website templates like Classic Style, there’s no need to look for anything else. As the online shopping trend is burgeoning, the demand for free HTML eCommerce templates is increasing in a great manner. Download one of these templates and stand out from the crowd. Visit our blog for amazing templates for business, photography, restaurant, agency, and multipurpose. superb thanks for sharing with us…….